One can’t help but try to read a series of words on white paper as a text. 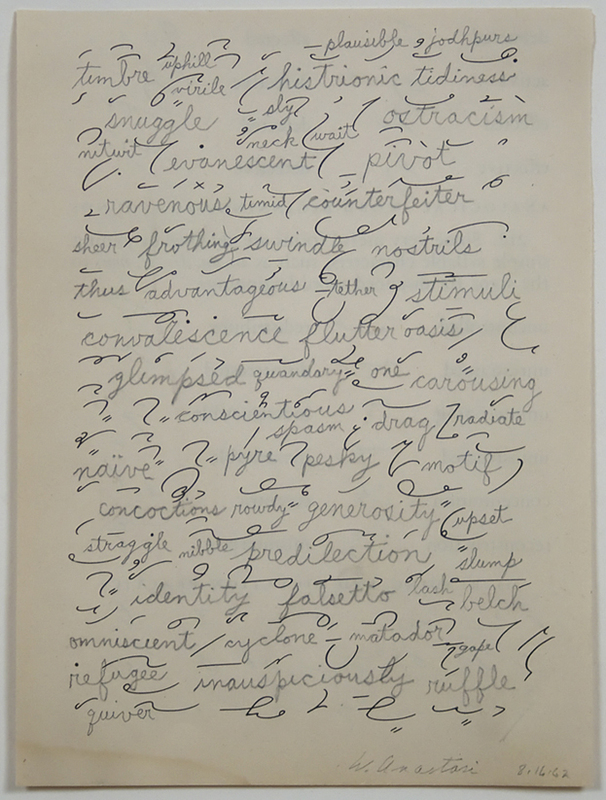 In the case of William Anastasi’s Word Drawing Over Shorthand Practice Page works from 1962, however, this effort is inevitably frustrated. Errant words and intrusive gaps repeatedly force the eye from its habitual left-to-right, top-to-bottom path until it finally wanders free, released from any predetermined direction. That is, the eye begins moving across the page as it would through a text, but ends by moving more as it would across the surface of a drawing. The title of the work indicates that the composition began with a shorthand practice page: the series of printed loops, squiggles, and circles that intersperse the text throughout. On the one hand, the term shorthand suggests that these apparently illegible marks might be read as words, as communication, if one only knew how to decode them. On the other hand, referring to the sheet as a practice page implies that the order and repetition of the marks are intended to enable the user to improve his or her penmanship rather than to communicate. In the end, each side of the opposition here seems to resonate with one of the two words found in the first half of the title: whereas a drawing was traditionally conceived as a kind of practice page for the composition of a painting, here the negative spaces between the mute shorthand marks act as the compositional frame in which real live words have been placed. This is regarding a word drawing on a page from a shorthand instruction book. It was done in February of 1962. 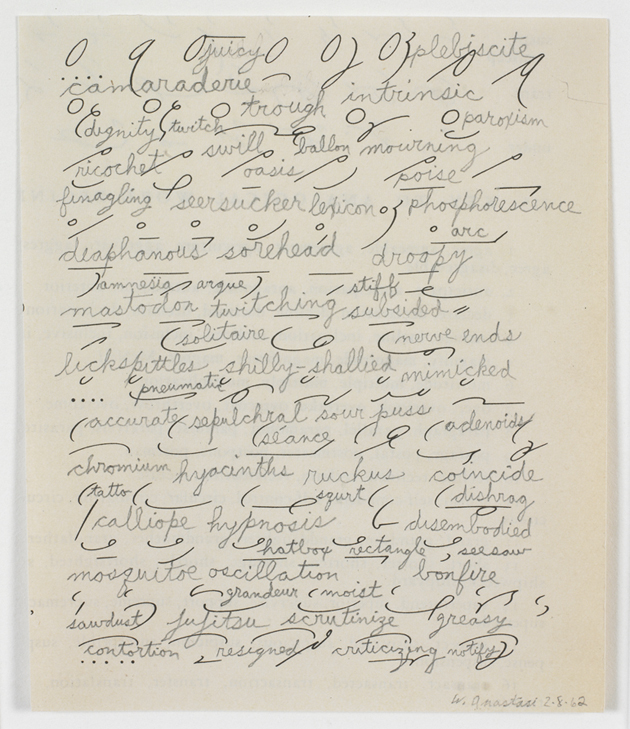 The thoughts which led to this work were related to the thought that if there were words that most people who know how to read could make out–decipher–we’d have one sort of blind poetry, assuming someone was reading it and not looking at it as a picture without reading it. And if someone familiar with the kind of shorthand this is was reading it from left to right and paid attention to the shorthand signification, it would turn into a different kind of poetry. If that’s not too strong a word. I’m not familiar with the shorthand system on the page, and I realized that if I was familiar with it, very likely a very different sequence of words would probably come out, because that would affect my thinking, obviously, if I’m looking at it and I’m being fed images that mean words. I certainly don’t remember the words; some of them I enjoy. Mosquito, oscillation, I enjoy for some reason, after all these years. Looking at it now after all this time it seems as though I might have found that a word could trigger a word far away from the meaning of the first word. Sepulchral, séance, sourpuss. [laughter] I’m enjoying it more than I usually enjoy my old work, as a matter of fact. Maybe part of what I was doing was being nudged in the poetry department by the ready-made drawing of the people who put together the page of shorthand symbols. Whatever the idea meant for me then, and it’s impossible to be sure that my memory is at all accurate, but whatever it meant after–fifty years, is it?–I would guess that if I could find such a book of shorthand practice, well obviously a very different kind of series of words would come out. My handwriting had not changed very much from I guess about 1942 or ’43, when I was nine or ten, to when I was three times that old. I can remember enough about this to be sure that I wasn’t trying to make a handwriting any different than I would have writing a journal, or a letter…and I think the handwriting is somewhat affected, from the look of it, by the amount of space I had to play with on any given square inch of the page. It seems as though the amount of space between one shorthand symbol and another was begging for letters a bit bigger, maybe twice as big, as certain other letters. What can one make out of the meanings of these words? Take for example the array of words in the smaller of the two drawings. While some of the words that appear close to one another on the page do appear to be related in terms of meaning – swill and trough, for example, or seesaw and oscillation – no overall patterns emerge in terms of composition. In general, it is hard to see the group of words as sharing underlying commonalities in terms of source or subject matter: that is, they do not seem to form a distinct lexicon, in spite of the presence of that word in the upper center of the drawing. Perhaps then we ought to look for meaning in more unexpected places. Conspicuous are those moments where the relationship between the meaning of the words and the manner in which they are rendered appears to collapse. The word droopy droops, for example: the loop crowning the letter p appears to sag down, the tail of the letter bowing under its weight. In cases like squrt and tatts, the chains of letters do not in fact add up to words at all. Even so, they manage to read as misspellings – or perhaps shorthand – for the words squirt and tattoos. Some of the more obscure words in the drawing might strike the viewer in a similar way: the word ballon, for example, which means “lightness of step” in ballet, could easily be mistaken as another case of misspelling or shorthand vis-à-vis the word balloon. Indeed, ballon does mean balloon in French; its English meaning is just a conventionally agreed upon instance of metonymy, a “short-handing” not only of spelling but also, as it were, of the word’s reference itself. In such cases, the practice of shorthand – and indeed the drawing itself – come to appear less as a mere means of saving (or in the case of the drawing, wasting) time, and more as one of the principle means by which words come to be born, grow old, and die. Now this is a drawing of READING A LINE ON A WALL. This piece is all capital letters, and that’s the way it was done for the Dwan Gallery show of works, text works, on a wall. And I remember Robert Morris was in it; I don’t remember who else offhand. But I do remember that Robert Morris was in it. I think maybe Mel Bochner was in it. I’m not sure because she did more than one of these shows. But anyway, this was printing on the wall, and although this shows more or less the complete drawing of a complete one of the walls at Dwan, maybe taken from a photograph of that wall, this was at the same time as the idea of putting a painting on the wall that’s a ten percent or so reduction [in size from] the wall, a picture of the very wall. The READING A LINE ON A WALL I see as related to that idea: the picture of putting a painting on the wall is one way of bouncing the artwork off of the viewer, let’s say. I don’t know whether that’s an accurate way of putting it, but to me it kind of relates with talking to yourself, maybe. READING A LINE ON A WALL also, maybe in an even more direct way, throws the artwork and the viewer together. It’s telling you what you’re doing, as though you needed that. Maybe you need to know what you’re doing. Maybe I had that in my mind. I can walk into a room in a museum, or a room in an art gallery, and I could be saying to myself, what the hell are you doing? And if this was on the wall, at least I would know what I was doing regarding this one work. It is descriptive of the activity that the viewer finds herself or himself doing. It has held up for me as an idea. Some of the ideas hold up and some don’t hold up. Some, as time passes, I find myself saying, what in the world were you thinking of to have done that? To have made that? And this particular idea doesn’t have that effect. It’s as though, for me, it’s still fresh. And now we’re at August 1, 2011, and I’m sitting at a chair, rather comfortable for an office chair, and I had a hesitation about looking at images, reproductions of old work, and trying to find words. But it turns out that words came. READING A LINE ON A WALL. One thinks of the proverbial half-empty, half-full glass, the difference being that a phrase such as this can in fact be regarded as both completely full and completely empty: empty in the sense of being devoid of all content aside from the facts of its own legibility; full in the sense that during the moment when the reader reads of reading, all distinctions between the content of the work and the activity of the beholder dissolve into a state of self-awareness, immediacy, or, for lack of a better word, truth. It was just this sort of experience that many leading members of the New York art world sought from abstract works of art in the decades following the Second World War. Similar to the way Anastasi’s drawing positions the viewer to reflect on the implications of reading the word reading, the most highly regarded paintings and sculptures of the day were those that most thoroughly manifested the essence of their own means of expression through various modes of self-reference. However, like many of the most aesthetically rigorous works from the mid- and late 1960s, Anastasi’s drawing meets the criteria of that aesthetic paradigm in a way meant to demonstrate its blind spots rather than to manifest its virtues. The sparse white wall in the drawing recalls the prototypical appearance of walls in post-World War II art galleries and museums: indeed, the arrangement of air vents, electrical sockets, and molding corresponds quite precisely with their arrangement on one particular wall of the Virginia Dwan Gallery in New York, where Anastasi exhibited during the 1960s. The details of the drawing are composed so that neither the ceiling, the floor, nor any other walls appear, but rather so that the edges of the wall on all four sides correspond closely with the edges of the piece of paper. Purged of any sense of spatial recession other than the shallow, almost trompe l’oeil depiction of the vents and electrical sockets, the physical flatness of the sheet of paper itself participates fully in the imitation of the wall that the drawing depicts – potentially, the very wall on which it would hang. In one respect, the use of the word line in the text refers to one of the most longstanding cornerstones of the drawing medium. 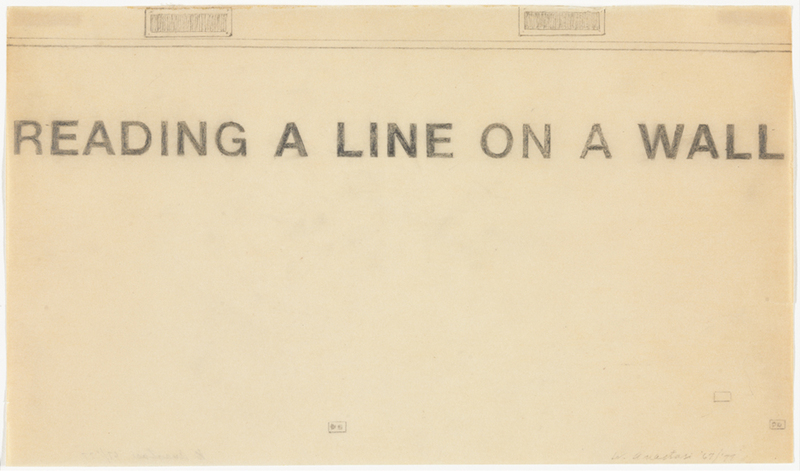 In another, it refers to one of the most basic components of literature, a “line of text.” (Perhaps ironically, the line of text is the only element of the drawing rendered in solid shades rather than lines.) While on one reading the word can be regarded as purely self-referential, on another it refers to a series of physical anchors on which that self-referential status depends: most literally and immediately, to the drawn lines within the drawing that secure the phrase’s legibility even after it has been taken off the wall; on a more figurative level, to the whole institution of the art gallery, whose walls are capable of validating a scrap of paper such as this as a work of fine art. William Anastasi (b. 1933, Philadelphia, PA) is a self-taught artist. Anastasi’s four notable early exhibitions opened at the Dwan Gallery (1966-1970). Recent solo exhibitions have been held at Michael Benevento/Orange Group, Los Angeles (2007); Peter Blum Gallery, New York (2008); and Galleria Mazzoli, Modena, Italy (2009). Anastasi has had retrospectives at Moore College of Art & Design, Philadelphia (1995); Nikolaj, Copenhagen Contemporary Art Center, Denmark (2001); The Drawing Center, New York (2007); Peter Blum Gallery, New York (2008); the Esbjerg Kunstmuseum, Denmark (2009); Galerie Jocelyn Wolff, Paris (2013); and The Bertha and Karl Leubsdorf Art Gallery, Hunter College, New York (2013). His work has been included in numerous group exhibitions, including at White Box, New York (2007); Sfeir-Semler Gallery, Hamburg (2008); the Museo de Arte Contemporáneo Esteban Vicente, Segovia, Spain (2009); the Solomon R. Guggenheim Museum, New York (2009); the Katonah Museum of Art, Katonah, New York (2010); the Museum of Contemporary Art, Roskilde, Denmark (2011); Hunter College/Times Square Gallery, New York (2012); The Frances Young Tang Teaching Museum and Art Gallery, Saratoga Springs, New York (2012); the Henry Moore Foundation, London (2012); Galerie Jocelyn Wolff, Paris and LABOR, Mexico City (2013); and Yvon Lambert, Paris (2013). A monograph on Anastasi with text by Richard Milazzo was published by Galleria Mazzoli (2009). He is the 2010 recipient of the biennial John Cage Award from the Foundation for Contemporary Arts. The artist’s book, The Cage Dialogues: A Memoir (2011), was published by Slought Foundation, Philadelphia. Anastasi presented a lecture at the Sorbonne on John Cage entitled “The Cage Dialogues” (2012). Anastasi lives and works in New York City. More information about his work can be found at www.williamanastasi.net. Robert Brennan (b. 1983, Olympia, WA) is a PhD candidate at the Institute of Fine Arts at New York University, where he focuses on twentieth-century art. His research interests range from artistic responses to the Industrial Revolution to German and American art during the Cold War. Robert received a BA in Studio Art and Religious Studies from Seattle University in 2007. He has since lived in China and Germany.